I’ve been really excited for this match. 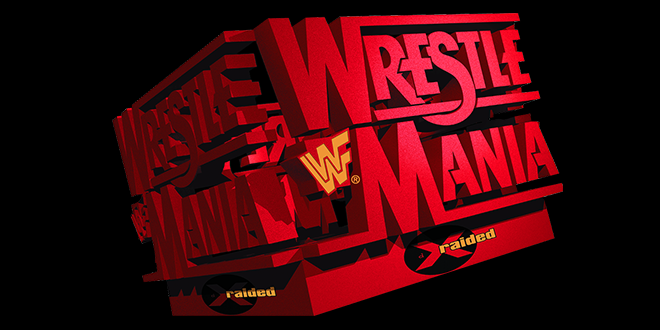 I began watching wrestling somewhere in between Wrestlemania XIII and XIV. This was my first Wrestlemania and my first Streak match that I saw in real time. I was eight years old when I saw this war between brothers. What was great about Kane is that the character walked in and was immediately over because he was sold as the brother of The Undertaker. The Deadman was an established veteran at this point in his career and Kane just became an extension of The Undertaker character. It put the question in fan’s heads that if The Immortal Undertaker was concerned with his brother’s power, there was definitely something to be afraid of. Now, take into account how Kane debuted. During the first Hell in a Cell match between The Undertaker and Shawn Michaels that changed the scope of steel cage matches forever. Kane debuted with the backing of and weeks of lead up from Paul Bearer, ripped the door off in a feat of great strength, commanded fire seemingly at will and laid The Deadman out. Kane had about as good of a debut that anyone has. The mystery of the character and the brother dynamic between the two men would culminate at Wrestlemania XIV in Boston. To this day, it remains one of my favorite matches of all time. To start the match, we have Pete Rose of all people come out to gain some cheap heat by making fun of the Red Sox. Kane comes out with Bearer to give Rose hit number 5,257 as he slams his head onto the mat with a Tombstone Piledriver. The powers that be turned it into a joke the next year with the chicken suit, but here it accomplished two things. It gave Kane an unpredictability factor. The character of Kane was always at his best when you had no clue what he was going to do next. The other thing it accomplished was it set the tone for the match. The Undertaker was a man on a reluctant mission. His hand was forced to try to stop his younger brother, but it was Kane with the great anger and just cause. Kane didn’t care who he hurt, as long as he hurt someone. In a strange way, it was the past mistakes of The Undertaker coming back to destroy him, but The Deadman had to keep his demons at bay. Kane was everything The Undertaker could have become and it made Kane tragic and powerful in a very different way that only added more dimensions to The Deadman. 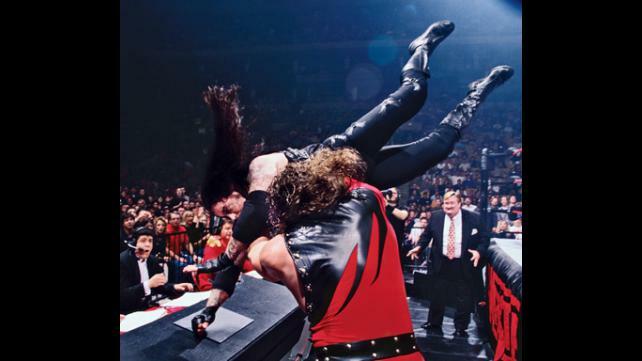 At Wrestlemania XIV, the complications of this dynamic between The Undertaker and Kane with Bearer as the man behind them would watch his two Frankenstein monsters tear each other apart just to prove who was more justified in being the dominant monster. 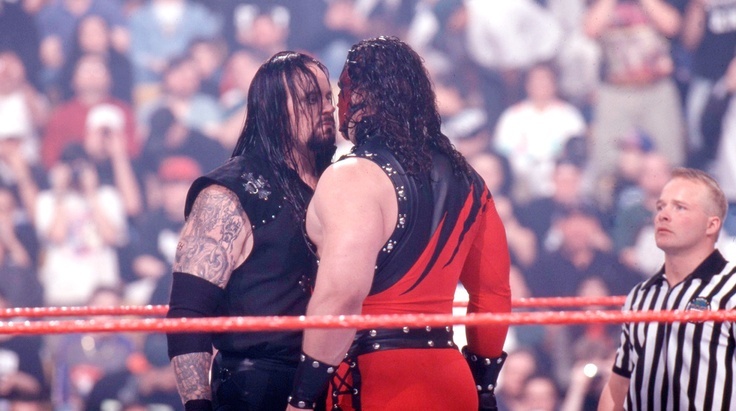 The match began with The Deadman and his brother face to face. The Undertaker would begin with a big strike. He takes a moment to see how it effects Kane before really getting into the deep end with him. This is important because I believe it is where the character of The Undertaker plateaus as the most dominant force in WWF. The Undertaker had made a career of dominating opponents, or trying to be conquered because of his immortality. I believe that moment is where it all ends for him. Its not that The Deadman stops being what he is, but if you really watch that moment, it is also like The Undertaker sees that the old ways aren’t going to cut it anymore. He needs to change his game to survive and he needs to be better than he ever was before. I see it as the moment where Old School Undertaker becomes New School. I think it is a really powerful moment, but maybe I’m the only one who sees it that way. Regardless, we continue on. 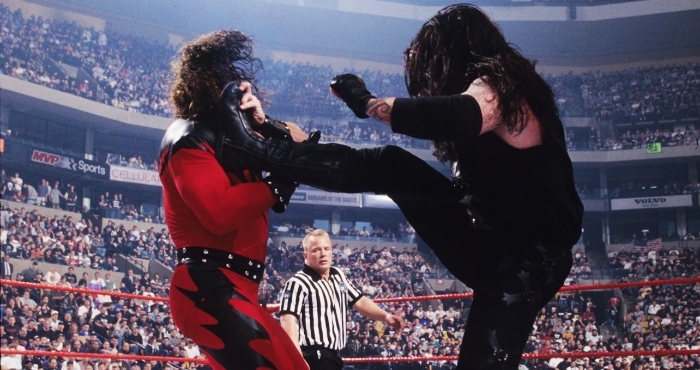 After that initial blow, the match moves into powerful strikes from The Undertaker who beats Kane into the corner. Kane strikes back with an elbow and tries to dominate The Undertaker. This back and forth battle for the upper hand continues for a good stretch of time in the match. The Undertaker’s defiance to stay down was fully matched by Kane’s desire to keep him down. Both men are in peak physical condition and the tempo picks up quickly for two big men to start off a match this fiercely. Kane gains the upper hand by trying for a tree of woe that the men didn’t pull off, but his feat of strength was enough to push the match his way. Kane drags The Undertaker back into the ring and gets a long two count after a flying clothesline from the top rope. 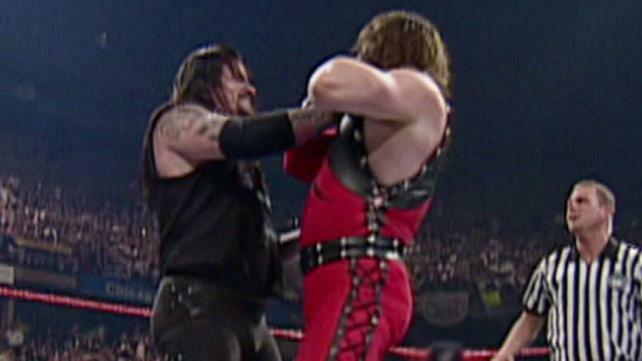 Kane throws bomb and bomb of strikes onto The Deadman, but The Undertaker fights back again. They trade bombs until The Undertaker attempts the Tombstone, but Kane reverses it into a Tombstone of his own that connects for another long long two count. Kane’s anger consumes him and he becomes even more aggressive onto The Undertaker but it is here that The Undertaker breaks through. He is able to land blow after blow to Kane and succeeds in knocking him down with a clothesline. Kane tries to fight back as the tide as fully turned in this match and The Undertaker drops Kane with a chokeslam. The Undertaker then motions over his throat for the end and he connects with the Tombstone Piledriver. However, Kane kicks out at two. Let’s talk about that for a minute. Sure, Taker kicks out of his own move, but Kane kicking out of the Tombstone? I hope you understand how mind blowing that is. That alone puts Kane as much more a threat to The Undertaker that the most dominate move wasn’t enough to keep Kane down. Kane is legitimate after that point in the eyes of WWF fans. I want to make this clear because the match continues with a huge leg drop from The Undertaker and a second Tombstone Piledriver that Kane somehow, someway kicks out of. Kane has kicked out of two Tombstones. That was unthinkable in the WWF world. 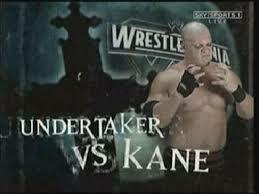 Kane’s anger and drive to destroy The Undertaker was so strong that not even two Tombstones could put him down. It is clear how dangerous Kane is. Can anyone except The Undertaker put him down? Can The Undertaker even put him down when two Tombstones won’t even work. Kane had proven his point as a character. He wasn’t going to stop, ever. The Undertaker knew this and it all made sense as to why he didn’t want to face his brother. The Undertaker did what needed to be done and a third Tombstone would finally put Kane down for three.